One of the first people to document the ongoing attempts to suppress the gold price was Frank Veneroso. Next was Bill Murphy of GATA.org. GATA continues to press the issue. Gata has discovered that the IMF instructed its member banks to treat gold that had been leased to bullion banks and sold into the market, as if it were still in the vault! www.gata.org/imfgoldswapspaperapril2006.pdf . Imagine if an entrepreneur was running his business in this underhanded manner – how long would the government allow that? A few years ago John Embry, while he was Portfolio Manager at RBC Global Investment Fund - a multi-billion dollar resource fund at the Royal Bank - prepared a memo for the bank's clients that detailed the manipulation in the gold market. Ted Butler has written extensively on the manipulation in the silver market. This is something I have observed first hand since I became interested in silver in the mid-1960's. It seemed that every time silver reached a peak, an invisible hand came out of nowhere and knocked the price back down to the starting point again. I wrote an article about this titled: ‘Once upon a time, in Never- Never Land'. Every time a geo-political event, or a serious economic happening, such as the collapse of Bear-Stearns, causes gold to rise, (as it would be expected to do since it has always been a ‘safe haven investment'), the price immediately gets trounced, and investors and producers accept this new price as ‘THE price', since the new event has now been discounted. Whenever common sense tells you something is happening that should cause a rise in the price of gold and silver, you can count on intervention to cap the price. As a result, millions of investors and mining companies have lost billions of dollars that they would have earned if these markets had been allowed to run their normal course. This chart shows steady buying interest that took price from the low at 955.00 on July 14 th to 985.00 the next day. The buying took place in Asia , then Europe , and carried over for about an hour in New York , when suddenly, in the space of minutes, an unseen entity dumped gold in the form of futures contracts (green line), without any attempt to obtain the best price possible. In about 5 minutes the gold price was down by 15.00, and the rise was over, as price drifted sideways for the rest of the day. It was discovered later that several large banks, suspected to be HSBC and JPMorgan Chase and possibly one other bank, had switched from being ‘net long' 5,381 gold contracts at the beginning of July 2008, to being ‘net short' 87,609 gold contracts by the end of July. That is a 94,000 contract ‘turnaround' and smacks of blatant interference in the market place, since these banks do not produce gold, nor are they likely to be hedging against that much gold in the vaults, since they do not own physical gold. Such a dramatic switch without any change in fundamentals is beyond reason. Featured is the daily gold chart from October 13 th . The blue line shows steady demand followed by consolidation early Oct 14 th as recorded via the red line. Then a mysterious seller showed up shortly after the COMEX began trading in New York , and in the space of minutes the price was knocked down by 30.00. This is totally illogical, since the seller has no interest in obtaining the best price. His only interest is to destroy the price. “In 1980 we neglected to control the price of gold. That was a mistake.” Paul Volcker. “Central banks are ready to lease gold, should the price rise.” Alan Greenspan during Congressional testimony July 24/1998). Featured is the price action right after the COMEX began trading in New York on October 16 th . Within a few minutes the price was knocked down by 35.00 (green line), after price had established a solid trading range between 830.00 and 850.00 during the previous two days (red and blue lines). This illogical dumping of gold contracts caused margin related selling to bring the price down another 15.00 before bargain hunters were able to level the price around the 800.00 mark. These are just some of the examples of ‘irrational behavior' on the part of several large traders on the COMEX, whose actions are not being controlled by the people who oversee the COMEX. While this article deals primarily with gold, the same manipulation exists in the silver markets. To repeat an earlier comment, ‘millions of investors (including miners), have lost billions of dollars because of the manipulation'. The US government is able to interfere in the markets by way of the Exchange Stabilization Fund which is run by the Federal Reserve and the Treasury Department. The size of the manipulation referred to in this article could not take place without the encouragement that is very likely provided by people who are highly placed in government. The effect of this manipulation in the gold and silver markets is an artificial low price. In view of the fact that bullish events are not being allowed to permit prices to rise, nevertheless these events will eventually have a positive effect on the price. The cause is real, but the effect is delayed. The steam in the kettle continues to boil, despite the lid being clamped down. The artificial low price stops the development of mining projects that would have been profitable at the higher price. The artificial low price also cuts into profit margins at every producing mine, making it more difficult to obtain funding for exploration to increase resources. Every mine in the world is at all times a ‘depleting asset' and needs exploration to postpone the day when the last ounce is mined. THE MANIPULATORS ONLY HAVE TWO WEAPONS. The ammunition used by the manipulators is provided by two sources: Central banks (including the IMF), and the COMEX. While there is nothing anyone can do about the gold selling that originates with the central banks, there are ways to choke off the amount of precious metal that flows into the COMEX warehouses. Those of us who are tired of the manipulators picking our pockets need to become active. In 1978 – 1979 it was a rising silver price that caused gold to rise – silver was the leader. It makes sense therefore to concentrate on silver, especially since the central banks do not have hoards of silver. Next, (and still communicating to mining CEO's), instead of keeping money in the bank, or in various kinds of short-term notes, store up silver, and show us that you believe in the product you are producing. Instead of cash on hand, buy futures contracts, and keep rolling them over. Coin dealers and wholesalers need to buy 5,000 oz bars from the COMEX, take delivery, and contact a refiner who will turn the silver into retail products. If your operation is not large enough for a 5,000 oz purchase then buy silver from people like Jason Hommel, who was smart enough to start doing this on a large scale. Investors who can afford to spend $55,000.00 should consider buying a silver contract from the COMEX and taking delivery. James Sinclair at JSMineset.com will show you how to go about that. Finally, anyone who holds any kind of a certificate that promises to deliver silver, needs to make sure that the bank or institution that stores the silver, is willing to provide bar numbers. Otherwise when the day comes to collect, you may find that the silver does not exist. On my website you will find an article that I wrote about a fund that stores gold and silver at a bank in Western Canada . They invite auditors twice a year to audit the inventory. Cartoon courtesy Gary Varvel, Indy Star. 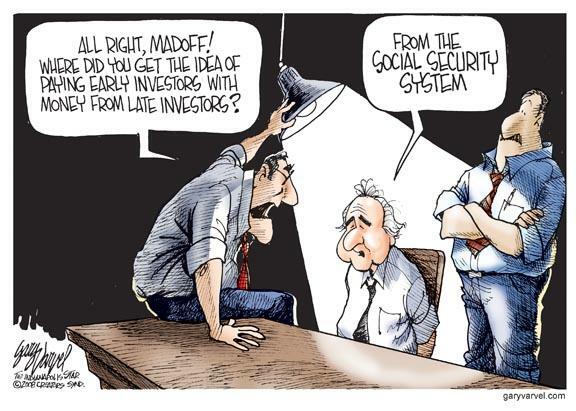 The Madoff scheme is but one example of the lack of oversight on the part of people who have been placed in the position of protecting the public. In the US Congress, two of the people responsible for the mess that was created by Freddie Mac and Fannie Mae: Congressman Barney Franks and Senator Chris Dodd, are now part of the group that is trying to ‘fix' the problem. The foxes are in the henhouse! It was Franks and Dodd, who for years received money from Fannie and Freddie, while they stood in the way of people who wanted to tighten the lending standard at these two mortgage lending institutions. Whatever happened to responsibility? Where is the outrage? Featured is the weekly gold chart. Price is ready to breakout on the upside. The supporting indicators are positive (green dashed arrows). The 7 – 8 week cycles have been short (twice at 6 weeks). We are due for a longer cycle. A close above the blue arrow will indicate that week #4 is the start of a run up to the green arrow. Once 925.00 is reached, then 975 is next. Since Labor day the Federal Reserve's assets (including huge amounts of toxic assets), have increased from 905.7 billion to 2.3 trillion dollars. This, along with the increase in the monetary base is going to add to price inflation and will cause a lot of investment money to enter the gold market. The gold rally that started in November has only just begun. Featured is the weekly silver chart. Price has been rising since late October. The supporting indicators are positive (green dashed arrows). A close above the blue arrow sets up a target at the green arrow. DISCLAIMER: Please do your own due diligence. I am NOT responsible for your trading decisions.